After more than 10 years of searching for a farm to call our own, we were able to purchase 76 acres of Northwestern Wisconsin farmland in December of 2013. What started as my husband’s childhood dream, grew into a family goal and is now our awesome reality in Elk Mound, WI. We love farm animals and have a strong passion for locally grown “real” food and sustainable agriculture. My husband, Scott, is the farmer. He grew up working on his uncle’s dairy farm in Bloomer, WI. After graduating college with a degree in agriculture, he has been focusing on grain farming and helping other local farmers grow large grains. His love for working with animals stayed with him though, which is what led us to purchasing our own farm and raising lamb, pork, beef, and poultry. He has a true passion for all things agriculture. I am the farmer in-training. It’s what happens when a city girl falls in love with a farmer. I grew up in Chippewa Falls, WI and after college, couldn’t wait to get to a bigger city. I lived in Hudson while working in Saint Paul for a bit, before moving back to the area and meeting Scott. I am a computer programmer by day, but dream about farming most nights. We have 5 children that take up a good amount of my time, but I squeeze in trips to the barn and walks in the pasture as much as I can. 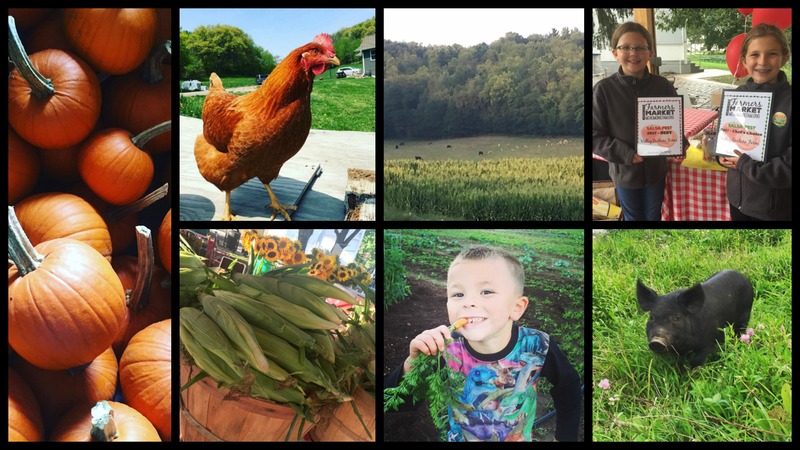 Since purchasing the farm, I have become very interested in homesteading, natural living, clean eating and becoming self-sustainable – follow the blog for tips, recipes, and to learn more about why we do what we do here on the farm. I’ve also found a knack for growing plants! This has allowed me to cut back on my computer programming work, so I can grow produce, herbs & flowers for our CSA members and spend time with the community at the farmers market each week. We also REALLY enjoy sharing our farm and connecting with the community. 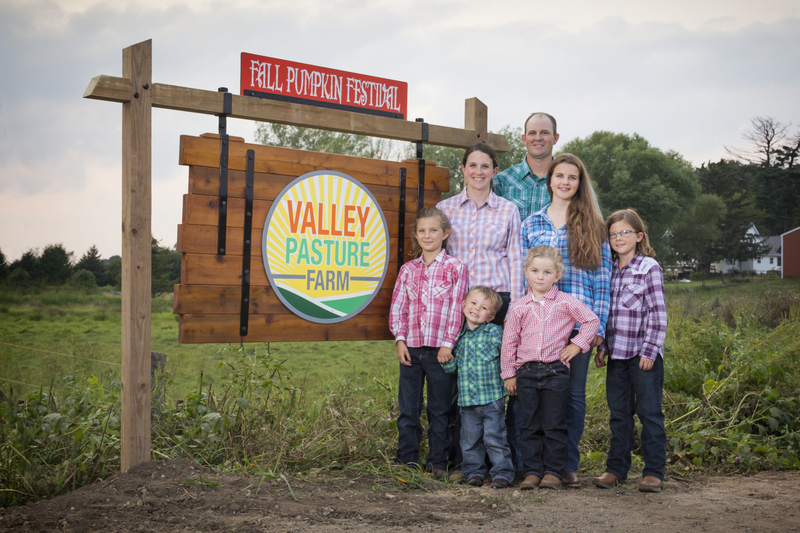 In 2015, we began welcoming guests to Valley Pasture Farm during our Fall Harvest Festival and Pumpkin Patch. In 2016, we started an annual food-drive to collect non-perishable items for Stepping Stones of Dunn County during the festival. In 2017, we created a formal Community Supported Agriculture (CSA) program by offering produce shares and connecting with customers at the Menomonie Farmers Market. In 2018, we expanded our CSA program by offering market shares to connect our farmers market customers more directly to our farm and increasing our CSA memberships. Fresh, local, all-natural farm products! At Valley Pasture Farm, we sell farm-fresh eggs, meat from animals raised right on our pastures, and beautiful produce through our on-farm stand, Menomonie Farmers Market, and through our Community Supported Agriculture (CSA) programs. Many of the animals we raise are heritage breeds that thrive on a grass based diet with very minimal grain. In addition to grass, most of our animals also get plenty of produce scraps, a corn-free & soy-free feed mix, and free choice minerals specific to their breed needs. Learn more about heritage breeds from The Livestock Conservancy. Create lasting memories at our Pumpkin Patch! September and October each year, we invite you to the farm in Elk Mound, Wisconsin for our Fall Harvest Festival and Pumpkin Patch. Attractions include a 3-acre corn maze, wooded spooky trail, straw forts, hay maze, giant slide, farm animals, pumpkin cannon, play areas, and more. It’s sure to be a fun time for the whole family! We are conveniently located just off of I-94 and State Highway 29, between Eau Claire and Menomonie, Wisconsin.